While in exile from Nigeria in 1995, Nobel laureate Wole Soyinka took haven at Harvard. Soyinka, a writer and political activist whose outspoken opposition to General Sani Abacha’s brutal regime had made it unsafe for him to remain in his native Nigeria, accepted a fellowship at the Du Bois Institute for African and African American Research. 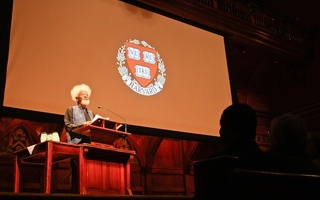 When he arrived at Harvard, Soyinka was reunited with his friend and Du Bois Institute Chair Henry Louis “Skip” Gates Jr., whom he first met at the University of Cambridge in the 1970s when Soyinka was a visiting professor in the English Department and Gates was his only student in African Literature. Although Soyinka intended to stay at Harvard for much of his exile, which ended in 1998 with Abacha’s death, something made him change his mind. Here is a man who lived in exile four different times during his life, who was arrested ten times and who spent more than two years in prison, most of it in solitary confinement in a 4-by-8 foot cell. He had a price on his head at least five times. He is tougher than most. To the delight of Gates and the Department of African and African American Studies, Soyinka agreed to brave the cold weather and return to the Du Bois Institute as the inaugural Alphone Fletcher Junior Fellow for the 2004-2005 academic year. Among other projects, Soyinka will be writing the third part of his memoirs and completing a volume of essays. Late last month, just as the temperatures were beginning to dip into the 40s, Soyinka spoke with The Crimson about his life as an artist and an activist, his fortuitous first encounter with Gates and his plan to survive the winter. With his large white Afro and beard, sonorous baritone voice and tall stature, Soyinka has a commanding presence. His spacious office is located across the hall from Gates’, and his shelves are overflowing with books, many of which have “Africa” written somewhere along their spines. A playwright, poet and novelist, Soyinka is considered one of contemporary Africa’s greatest literary voices. In 1986, he became the first person of African descent to win the Nobel Prize in Literature. Despite the historical significance of his achievement, Soyinka says the award—and the attention that it brought to his writings and political causes—did not change his approach to his craft. “It’s not a watershed in my existence,” he says. Nobel laureates Nadine Gordimer, Derek Walcott, and Toni Morrison joined hundreds of audience members last night at the John F.